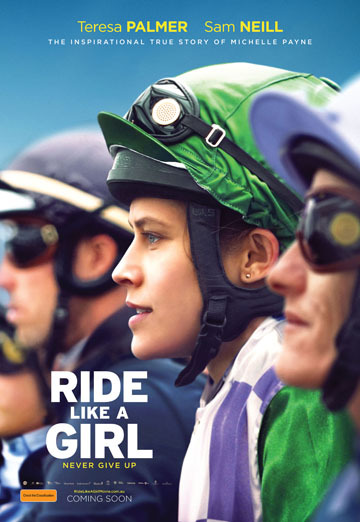 Transmission Films is delighted to announce that RIDE LIKE A GIRL, the highly anticipated feature film about Michelle Payne, the first female jockey to win the Melbourne Cup will be released in cinemas across Australia on 26th September 2019. Transmission Films has also given Australian audiences their first glimpse of the film, with the release of the first trailer. RIDE LIKE A GIRL is the directorial debut from renowned Australian actor Rachel Griffiths. It stars Teresa Palmer as Michelle Payne alongside Sam Neill, Sullivan Stapleton, Magda Szubanski and Stevie Payne, Michelle’s brother who plays himself in the film. RIDE LIKE A GIRL is produced by Richard Keddie and written by Andrew Knight and Elise McCredie. As a little girl, Michelle Payne dreams of the impossible: winning the Melbourne Cup — horse-racing's toughest two-mile race. The youngest of 10 children, Michelle is raised by single father Paddy. She leaves school at 15 to become a jockey and after early failures she finds her feet, but a family tragedy, followed by her own near fatal horse fall all but ends the dream. But with the love of her dad and her brother Stevie, Michelle will not give up. Against all the medical advice, and the protests of her siblings, she rides on, and meets Prince of Penzance. Together they overcome impossible odds for a shot at the dream: a ride in the 2015 Melbourne Cup, at odds of 100 to 1. The rest is history. Transmission Films’ joint Managing Directors Andrew Mackie and Richard Payten said “Michelle Payne's inspirational life is much more than her historic Melbourne Cup win. This is a gripping story of family and determination. We can't wait to share the film with Australia in September."